The MESA 4I24 series of cards are 96 or 72 bit parallel I/O interfaces implemented on the PC/104 bus. 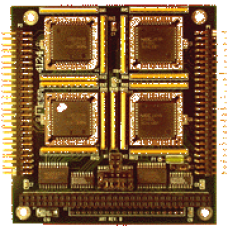 The 4I24 uses 4 (4I24, 4I24I) or 3 (4I24M) socketed 82C55 PIO chips to give for a total of 96 I/O bits (4I24, 4I24I) or 72 I/O bits (4I24M). 3.3K Pullup resistors are provided on all ports to simplify interfacing to contact closure, opto-isolators, etc. The 4I24 series includes three models with different I/O connectors. The standard 4I24 uses two 50 pin headers for I/O connections. The 50 pin connectors each have 48 I/O bits, ground, and power. The 4I24I uses four 26 pin headers with ISO standard pinout (24 I/O bits per 26 pin connector, pin 2 = gnd, pin 26= 5V). The 4I24M has I/O module rack compatible pinouts with three 50 pin connectors each having 24 I/O bits with interleaved grounds. 5V power on the I/O connectors is fused on the 4I24. All 4I24 models use the 16 bit stack through type PC/104 bus architecture. Four layer circuit card construction is used to minimize radiated EMI and provide optimum ground and power integrity. All CMOS design keeps power consumption to a minimum.